*NOT ALL OF US CAN DO GREAT THINGS – BUT, WE CAN DO SMALL THINGS WITH GREAT LOVE. 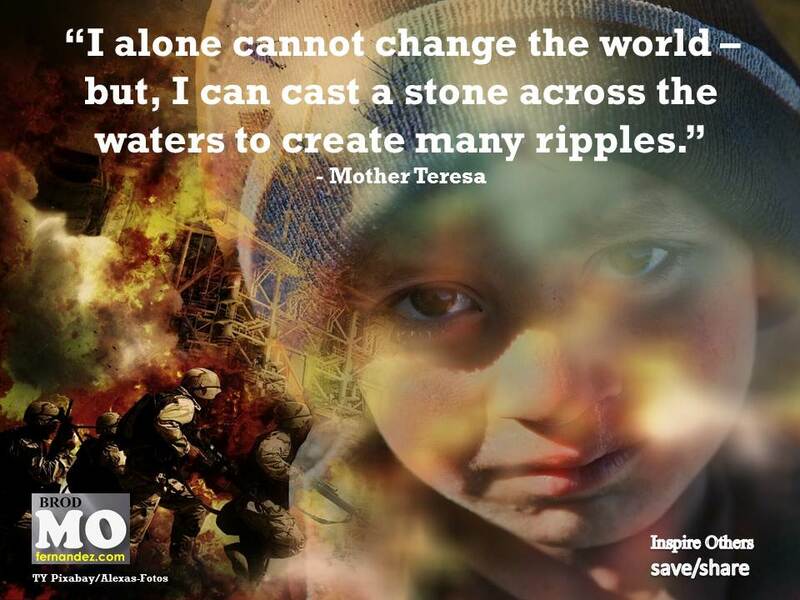 *I ALONE CANNOT CHANGE THE WORLD – BUT, I CAN CAST A STONE ACROSS THE WATERS TO CREATE MANY RIPPLES. *THESE ARE THE WAYS WE CAN PRACTICE HUMILITY: SPEAK AS LITTLE AS POSSIBLE ABOUT YOURSELF. MIND YOUR OWN BUSINESS. AVOID MANAGING OTHER PEOPLE’S AFFAIRS. AVOID CURIOSITY. ACCEPT CONTRADICTIONS AND CORRECTIONS CHEERFULLY. ACCEPT INSULTS AND INJURIES. ACCEPT BEING SLIGHTED, FORGOTTEN AND DISLIKED. BE KIND AND GENTLE, EVEN UNDER PROVOCATION. ALWAYS CHOOSE THE HARDEST. *I’M A LITTLE PENCIL IN THE HAND OF WRITING GOD, WHO IS SENDING A LOVE LETTER TO THE WORLD. *PRAYER ISN’T ASKING, IT’S PUTTING YOURSELF IN THE HANDS OF GOD – AND LISTENING TO HIS VOICE IN DEPTH OF OUR HEARTS. *IF YOU’RE HUMBLE, NEITHER PRAISE NOR DISGRACE CAN TOUCH YOU – BECAUSE YOU KNOW WHO YOU ARE. *A LIFE NOT LIVED FOR OTHERS ISN’T LIFE AT ALL! *NEVER WORRY ABOUT NUMBERS. HELP ONE PERSON AT A TIME – AND ALWAYS START WITH THE PERSON NEAREST YOU. *GIVE YOURSELF FULLY TO GOD. HE’LL USE YOU TO ACCOMPLISH GREAT THINGS ON THE CONDITION THAT YOU BELIEVE MUCH MORE IN HIS LOVE THAN IN YOUR WEAKNESS. *PEOPLE ARE UNREALISTIC, ILLOGICAL AND SELF-CENTERED – BUT LOVE THEM ANYWAY. *LOVE IS FRUIT IN SEASON AT ALL TIMES – AND WITHIN REACH OF EVERY HAND!